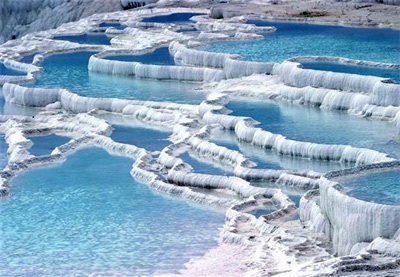 The obvious attraction of Pamukkale is the gleaming calcium traventines which are now a world heritage site.Pamukkale actually means "Cotton Castle" and it's easy to see why, with the distinct shape of the traventines. The terraces are formed by a chemical reaction that results in calcium carbonate sedimenting to form a traventine. The calcium rich waters are about 35.6 C when they first come from the ground and flow over the terraces into the beautiful pools. Above the traventines there is a Municipal pool and the Roman ruins of Hierapolis with the biggest necropolis in the world. There is also a thermal bath above the travengines, with the spring water's temperature being about 36C. The water is rich in minerals, is believed to have strong medicinal properties and is excellent for your general well being. Bring your swimsuit and enjoy Pamukkale's therapeutic waters. In nearby Karahayit, the spring water comes from the ground at around 56C and is rich in iron. The flow of this water over the rock results in the red colouring. Many people come to admire it's beauty. Colossau is situated on the hills about 7km away from Pamukkale. There is not much remaining of this ancient city, but you will find some traces of the Roman period theatre and some foundation constructions can be seen. This antique city is situated 60km away from Pamukkale. It was first constructed for defense purposes, but was later reconstructed by the Romans. The Apollo cult was important in Tripolis. Now days you can see some remnants of the theatre, city walls and some of the other buildings. 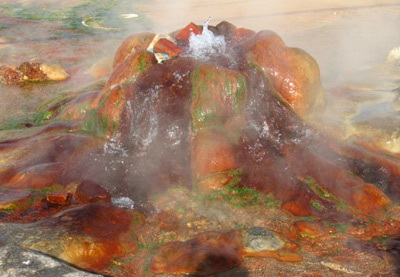 This area was first settled because of these thermal waters. 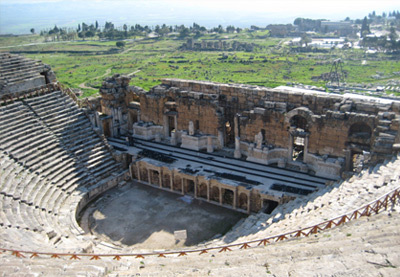 The city of Hierapolis was established in 190BC by the king of Pergamon, Eummanes II. The city was very prosperous under Roman rule and even more so under the Byzantines. You will find hte Basilica to the easy of the big bath right next to the road. 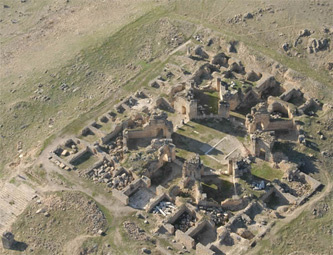 It's thought that it was constructed after Hierapolis became the centre of the Bishopry. The erection of the Basilicas and churches lead to the city's adoption of the Roman architectural style. 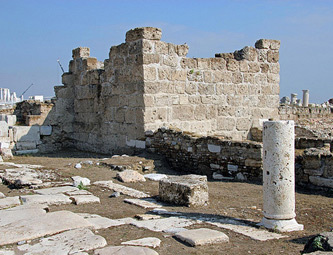 Towards the southern gate, close the Gymnasium and big bath you will find the Agora. The bazaar and great meetings took place here. Inscriptions were found during the excavations of the Agora which indicated the importance of cotton growing and weaving to the area. The Colonnaded Street is about 1km long and runs through the whole city. In Hierapolis high day, it would have been lined by stoas and important buildings. 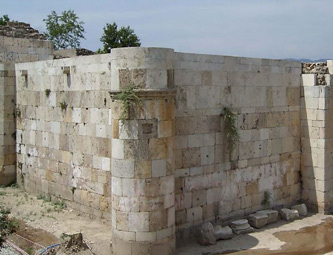 At the northern and southern ends of the street, outside the Byzantium city walls, you will find momumental gates, which were constructed during the Roman period. Today the great bath houses the meseum. It's thought that the interior of the building was covered in marbal. The construction is typical of Roman Baths. Saint Philippe Martrium is Octogonal in shape and was built on the site where it is thought that St Philip was martyred. Saint Philip was one of the twelve Apostles, he worked hard to spread Christianity in Hierapolis and together with his sons, founded the first christian community. The city is situated 6km from Pamukkale and was build in the 3rd century by King Antricos II. The city "Laodicia" was named after his wife Laodicee. Laodicia was an important site to see, as you will find one of the first seven churches built during the spread of Christianity. Laodicia's location was important, as it was situation on the road connecting the trading centres Ephesus and Miletos. Situated 7 km away from Pamukkale the Akhan Caravansary is a traditional travellers stop in between trade centres.